Welcome to a report to keep you informed on past and upcoming legislative issues. Part of your membership dues go to ensure that FOTA has skilled advisement from our lobbying firm Corcoran & Johnston, strategies to promote and protect OT in Florida. FOTA relies on membership support to advocate successfully. More members are needed to increase our ability to influence change. The 60-day Legislative Session will convene on March 5, 2019, with interim committee weeks being held in December, January and February. FOTA Hill day will be January 22, 2019. The following is a brief overview of work done since the last legislative session and legislative priorities we expect to work on throughout the upcoming session. State Health Plan Coverage:Following the 2017 addition of occupational therapy as a covered benefit under the state employee health plan we will work again to protect the language within the budget so the benefit remains. Opioid Abuse Epidemic: We have begun discussions with a coalition of other health care providers, including massage therapists, acupuncturists, chiropractors and physical therapists, on legislation to promote alternative treatment options for pain management. Medicaid Reimbursement:In March 2018, we arranged a meeting with Medicaid leadership at the Agency for Health Care Administration (AHCA) to discuss reimbursement challenges for occupational therapists. Since then, we have had ongoing conversations around CPT codes and access to occupational therapy. We will be continuing this work to better ensure adequate reimbursement levels. We also arranged a meeting directly with leadership of the Florida Association of Health Plans to help improve communication between providers and health plans. In addition, we have been in communication with the Department of Health regarding the CMS transition to managed care. In September 2018, DOH awarded the CMS contract to Wellcare Staywell. The contract award has been contested by South Florida Community Care Network. Patients were intended to transition on January 1, 2018, but that process has been delayed until the contract contest is resolved. We have relayed the concerns of occupational therapy providers regarding the lack of communication throughout the transition and have been informed that additional information will be provided to patients and providers once the contest is resolved. We will be following up with DOH to arrange a direct conversation between FOTA and CMS regarding access to occupational therapy services. Mental Health in Schools:Last Session, significant legislation addressing mental health access in schools was passed in response to the Parkland shooting. We have had ongoing conversations in regards to how occupational therapists can assist in providing mental health services in schools. Legislative leadership has not yet determined if they will re-visit the issue in the 2019 session, however we seek to be prepared to weigh-in on the issue if legislation is filed. Telemedicine: We anticipate the legislature will again attempt legislation addressing the practice of telemedicine in Florida. We will work to ensure whatever legislation is introduced and potentially passed, includes occupational therapy as a health care practice that can be delivered through telemedicine. State Health Plan Coverage:During the 2017 Legislative Session, we were successful in obtaining state health plan coverage for occupational therapy through language included in the state budget. We were successful in ensuring this language stayed in the 2018 budget passed by the legislature and signed by the Governor. Telemedicine: Legislation passed in 2016 directed the creation of the Florida Telehealth Advisory Council to make recommendations regarding the practice of telehealth in the state. The Council issued their report just prior to the start of the 2018 Legislative Session, and included recommendations such as defining the practice, establishing a standard of care, promoting access to care, and requiring Florida licensure. The report also included recommendations towards mandated health insurance coverage and payment parity with in-person consultations. SB 280 by Senator Aaron Bean and HB 793 by Representative Ralph Massullo were filed subsequently and incorporated the Council’s recommendations, with the exception of mandated reimbursement and parity. Occupational therapists would have been included as practitioners able to practice telemedicine in the state with applicable state licensure. While SB 280 passed the full Senate, it was never taken-up by the House and HB 793 was never heard in a committee of reference. We will continue to work with other industry leaders to move the legislation forward. Opioid Abuse Epidemic:At the beginning of session, the Governor proposed comprehensive legislation to address the opioid abuse epidemic within the state. HB 21 by Representative Jim Boyd passed both chambers and includes significant reforms, such as limitations on the initial prescription of opioids for acute pain, increased training for prescribers, improved access to medication assisted treatment and additional requirements for use of the prescription drug monitoring program (PDMP). Also included within the legislation is approximately $53M in funding towards substance abuse treatment services. The Governor signed HB 21 into law on March 19. Representatives from FOTA testified before both the House and Senate Appropriations Committees regarding the benefits of non-pharmacological treatment to prevent and treat opioid abuse, such as occupational therapy. Health and Human Services Budget: The 2018-19 General Appropriations Act passed by the legislature is the largest in state history, totaling just over $88.7B. Approximately one-third, or $37B, of the funds are designated towards health and human services. Funding for Medicaid services were increased by $600M to account for increased enrollment and costs, and an additional $128M was provided for nursing homes, primarily to help offset costs towards purchasing new mandatory generators. Rate enhancements for high Medicaid hospitals are maintained, and the budget incorporates $1.5 billion in Low Income Pool funding. The budget also incorporates a reduction for retroactive Medicaid eligibility for non-pregnant adults. Student Safety: Following the tragedy in Parkland, the legislature was pressured to pass comprehensive legislation to increase school safety, improve access to mental health services, and restrict access to guns for certain populations. Related to school safety, HB 7026 creates a voluntary school marshal program, allowing school districts to let certain trained employees carry concealed weapons, and includes additional crisis response and training programs for schools. In total, the legislation appropriates $400M to school safety programs, including $69M for mental health in schools, $67M for the school marshal program, $98M for school building hardening, and $18.3 for mobile crisis teams. In addition, the bill will raise the age requirement for gun purchases from 18 to 21, ban the sale of bump stocks, enforce a three-day waiting period for all firearms, allow law enforcement to seize weapons from those taken into custody for involuntary examination under the Baker Act, and prevent those who have been adjudicated mentally defective or have been committed to a mental institution from owning or possessing a firearm until a court decides otherwise. Mental Health Services: SB 450 by Senator Rene Garcia intended to promote the use of peer specialists for recovery support as an essential element in the behavioral health care system. The bill passed the Senate floor unanimously and was sent to the House for consideration, but never placed on the calendar. The language was eventually amended into HB 1069, which primarily addressed increased regulation for recovery residences, in an attempt to move the legislation forward. However, HB 1069 also ultimately did not pass when it was sent back to the House with the additional peer specialist language and never taken up for a final vote. Trauma: A substantial topic of discussion throughout the health care industry over the last two decades has been state regulation of trauma centers. SB 1876 by Senator Dana Young and HB 1165 by Representative Jay Trumbull were significantly amended to incorporate language seen as a compromise amongst the hospital industry and intended to resolve decades long disputes over the approval of additional trauma centers. HB 1165 passed both chambers and has been signed into law by the Governor. Tax Exemptions for the Elderly: SB 1448 by Senator Kathleen Passidomo and HB 1123 by Representative Lori Berman would have authorized an exemption to the sales tax for those over the age of 60 in order to purchase items to assist them in living independently in their home, such as handrails, hospital beds and walkers. The legislation was supported by the Florida Association of Area Agencies on Aging and the Florida Alliance for Retired Americans. The Senate bill passed its first committee of reference but never move forward, while the House bill was never heard in a committee. PIP Reform: Bills were introduced in both the House and Senate to deregulate PIP auto insurance and repeal the state’s no-fault policy. The Senate bill also included a mandatory MedPay provision, that was not in the House version of the bill. The health care industry was significantly concerned with the potential loss of medical payment coverage within the legislation, which could potentially impact occupational therapy providers. Although the measure passed the House, the Senate bill ultimately died in committee when it did not have enough votes to pass following significant advocacy by both the insurance and healthcare industry. Alternative Treatment Options for Veterans: HB 303 by Representative Danny Burgess and SB 82 by Senator Greg Steube would have required the Florida Department of Veterans Affairs (DVA) to contract with providers for a two-year period to provide alternative treatment options for veterans with traumatic brain injury (TBI) or post-traumatic stress disorder (PTSD). The alternative treatments would have been limited to those which have at least one scientific or medical peer-reviewed study that shows a positive effect on TBI or PTSD and must be provided under the direction of a licensed physician, osteopathic physician, chiropractic physician, nurse, psychologist, clinical social worker, marriage and family therapist or mental health counselor. HB 303 passed its first committee of reference but did not move any further, while SB 82 was never considered in a committee. Students with Disabilities in Public Schools: SB 260 by Senator Lauren Book and HB 63 by Representative Katie Edwards-Walpole would have made significant revisions to the use of restraint techniques on students with disabilities. Under the legislation, definitions for exclusionary and nonexclusionary time would be updated in addition to specifications as to when each may be used and adding reporting and review requirements. In addition, specified physical restraint techniques would be prohibited. Both bills passed all of their committees of reference and were passed on the floor by their respective chambers. However, due to differences between the House and Senate versions, the legislation ultimately died on the final day of session. State Health Plan Coverage – Members of FOTA thanked those legislators who advocated on behalf of occupational therapy in order to add coverage under the state group health plan. 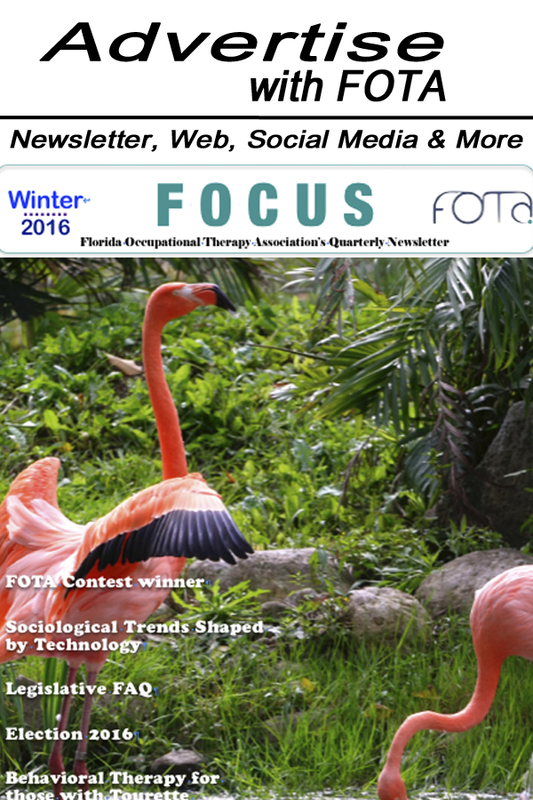 Opioid Abuse Epidemic – FOTA advocated for occupational therapy as a valuable component for solving the epidemic. These solutions were not the focus of the legislation passed this year but received favorable feedback in conversations with legislators. Telemedicine - FOTA representatives met with Senator Aaron Bean’s office and other legislators to advocate for legislation to define the practice of telemedicine in the state. The primary focus of the 2017 Legislative Session was adding coverage for occupational therapy on the state employee health plan. State employees have historically been unable to access occupational therapy services, as it was not a covered benefit unless the patient was diagnosed with a developmental disability. FOTA has advocated for this change for nearly 20 years but were successful in their first year working with the Corcoran and Johnston team. The benefit was added at the same level as physical therapy, including 60 visits per injury for employees in a HMO plan and 21 visits per 6 months for employees in a PPO plan. Once approved by the Governor, we assisted in preparing a press release sent by FOTA in recognition of the significant achievement for the organization. In addition, we coordinated with Senator Denise Grimsley, who championed the initiative in the legislature, to have her attend the FOTA Annual Conference in October. The first FOTA Hill Day organized by the Corcoran and Johnston team was very successful. FOTA members met with more than 12 legislators from the House and Senate Appropriations Committees, as well as promoted occupational therapy through space reserved in the 2nd floor rotunda. The primary messaging of FOTA Day centered around state employee coverage for occupational therapy. Members advocated regarding the benefits of occupational therapy, such as faster return to work and reduced health care costs. We will utilize the time between the 2018 and 2019 Legislative Sessions to begin planning and promoting FOTA’s legislative agenda, in order to give us a head start for next year. State Health Plan Coverage: We continue to work with the Department of Management Services (DMS) on implementation of the occupational therapy benefit for state employees. Just recently, we were notified of potential non-compliance by Capitol Health Plan. We are working with DMS and leadership at CHP to address the issue. In addition, we will continue to ensure that occupational therapy benefit language remains in the budget each year. Reimbursement: Medicaid reimbursement continues to be a potential issue for the occupational therapy industry each year. We have facilitated conversations with both the Florida Association of Health Plans and the Agency for Health Care Administration to discuss the issue, in an effort to help educate future strategy around reimbursement. Opioid Abuse Epidemic: Opioid abuse, and substance abuse services in general, will continue to be a significant budget and policy issue in the upcoming legislative session. We will be working with other professions. We will be working with other professions, such as physical therapy, massage therapy, and acupuncture, to non-pharmacological solutions in future legislation. Telemedicine: We anticipate that comprehensive legislation defining the use of telemedicine in Florida will continue to be introduced each session. As this legislation is pursued, we will work with legislative leadership to ensure that occupational therapy services may be provided utilizing this technology. Licensure Compacts: Last year, legislation was introduced in both the House and Senate to authorize Florida to join a physical therapy licensure compact. Similar legislation was not introduced again this year, as the physical therapy industry is still working on finalizing the issue through their own membership organization. We will continue to monitor all legislation which authorizes health care licensure compacts, in anticipation of eventually pursuing similar legislation for occupational therapy.